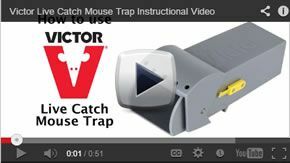 Solve your mouse problem even quicker with the 4-trap offer of the Victor® Live Catch Mouse Trap. Catch rather than kill the mice in your home or business and then set the traps again for reuse after disposing of the caught critter. With no poison or snapping parts to worry about, these traps can be used near children, pets, water and food, either indoors or outdoors. Bait – Add a little peanut butter at the far end of the trap. Place – Position the trap at any place the mouse is frequently seen. Release – When a mouse has been caught, follow your local authority’s guidelines for releasing a captured animal back into the wild. The emptied trap may then be saved for reuse in case you have another mouse problem to deal with. Even if you are only trying to get rid of one mouse, using all 4 in conjunction with each other can improve your odds for a swift success. And if it turns out that there are more uninvited guests you don’t even know about, you can catch up to 4 of them with this setup. These compact traps may be placed anywhere your mouse is expected to travel on its way to a food source. For outdoor use, try to place one near the suspected point of entry until you can determine for sure and make your home secure once again. Does having a dead mouse in your house repulse you even more than having a live one? With a Live Catch mouse trap, mice are captured without being killed, and you can free your captive without the fear of coming into physical contact with it. When you release it, make sure to do so only where local guidelines allow. The traps are too small!! Unless your house is infested only by baby mice... Don't waste your time and money thinking you will catch mice with it. So far no good! Observed a mouse running around my carpeted bedroom last night, so I got up extra early and bought four of these, followed the instructions perfectly and placed them in the various general areas that I observed the mouse visiting. When I came home from work today, it appeared that the traps had not been disturbed at all. Then it occurred to me that the laws of physics will not allow these traps to work unless they are placed on a hard surface. The “teeter totter” effect will not work on thick carpet. On top of that, I went online and reviewed the most common mistakes made when setting mousetraps and noticed that I made quite a few of those mistakes. So, I cut up a shoebox and placed the mouse traps on the various pieces of cardboard and we will see if they work tonight. These traps might be fantastic, but the instructions are absolutely TERRIBLE! It is disgusting that nobody within the company noticed how much detail is left out instructions. So disappointed . We appreciate the time taken to provide this feedback and apologize for the experience. This will be shared with our Product Managers. First mouse I caught easily within a couple hours. Let him go. Trap worked great. The second mouse though, I swear is mighty mouse. The trap winds up completely cleaned out and he's knocked the door off the hinge and dragged the trap across the room. This happens with little time passed between checking it. It is definitely a mouse as I've seen it but this one knows how to get free peanut butter snacks. A great product. By E. B. Inexpensive but very effective. Trapped a field mouse and safely released him. The traps work well. Our 2 cats sometimes bring in live mice and moles. We can catch them and put them out of the house. We had some traps and couldn't find any more locally. Mice are unharmed. Easy to release them. If you're a bit squeamish about mice, you don't need to touch or even really see them. mouse can open the door easily. never worked before. We are sorry to hear about this occurrence and will be happy to help. To ensure that the mouse is fully inside the trap when it triggers, we recommend making sure the bait is as far back into the trap as possible. Checking the trap often will reduce the stress on the mouse and lessen the attempts to escape as well. Feel free to contact our Consumer Relations Team at 1-855-5-VICTOR (1-855-584-2867) with any additional questions. I just caught my mouse in one of these. Peanut butter in the back, put it in someplace dark, along the wall in the kitchen and the next day, the door is closed, the cage is full. Just make sure you don't go just outside your house and let them go, I thought I caught 6 mice until I figured out it was the same one returning 6 times, but maybe you're not as dense as me. I've had the same traps for 10 years and had many inhabitants pay a temporary visit. Sometimes you get a clever mouse who gets the bait and escapes the trap, but they all eventually slip up and get caught. I love these traps. I've caught dozens of mice over the years. After realizing there's a mouse around, I set 5 or 6 of these in areas near the sighted mouse and I always catch a mouse within a few hours if not minutes. You do need to make sure the catch is working properly by slightly bending it if it's not exactly right. Also, place the trap where the mouse will likely approach it from the front or else the mouse can bump the trap and set it off without getting caught. Once you get the hang of it, these are awesome. I once had a mouse escape after catching it, but this can be avoided by checking the traps regularly and placing a piece of tape over the "door" after catching one. I use peanut butter as bait. It's best if the bait is fresh (less than a day old) so you can't just leave them around indefinitely and expect to catch one when it shows up. Set them when there's a mouse around. Highly effective and safe around kids and pets.